This smoker is lightweight, easy to assemble, excellently designed for ease of use and built to last. On the other hand, the product also has some minor flaws which need to take into consideration as well. Assembling the smoker can be done in a snap since it only comes in three major pieces. It is also lightweight; thus, transporting it from the assembly area to the backyard is not a problem. The modular construction and use of heavy gage coated steel to build this smoker make it superior than other brands. 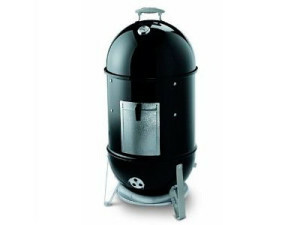 This smoker has a wider door making it easier to put additional charcoal and comes with a bottom ash catch pan. It also has built-in thermometer allowing temperature to be monitored with less difficulty; the door latch is spring loaded and has a lever type handle for better grip and the water pan is so designed to provide enough water capacity. The product is easy to operate with just simple instructions on how to use it for maximum advantage making it worth the investment.Internal temperature can be maintained easily and it can be left for many hours without having to add charcoal. Cleaning up after smoking can is done effortlessly as everything wipes clean easily. The door on the side is unstable and the water pan is too deep vertically, blocking the view of the coals opposite the door making it more difficult to add more coals or wood chips or refill the water pan. Likewise, there is no lid holder on the side for support when putting down the lid dome on any surface especially that there is so much condensation on the lid dome. Moreover, there are no eyelets or holes where you can check the meat or the grill level temp. The thermometer seems to be inconsistent. As the temperature increases, the more inaccurate it becomes. This smoker seems to be a good investment with only some minor flaws as downslide.